At Café Maelmin we serve a varied choice of lunches each and every Sunday from 11.30am. Naturally, there's the traditional roast beef option but there's always slow roasted belly pork plus a variety of tasty specials too! 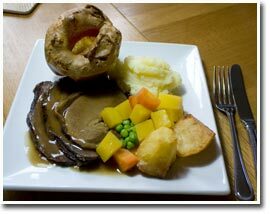 What could be better - Sunday lunch cooked for you - and no washing up. Remember, Café Maelmin is fully licensed, so we've beers and wines available to enjoy with your meal. Just look at this typical menu.